Personalized garden flags are super easy to make with burlap. I made myself a new summer mason jar version and thought I would share the process with you. I have actually made one of these before with an initial. You can see that tutorial here. I used basically the same process this time. The other version stayed outside for months and it still looks great. So I know this method works and will create beautiful flags that will last for a long time. You can watch how I made my flag in the video below. Remember this technique is super easy and meant to be personalized. What will you add to the front of your garden flag? If you can’t watch the video, then be sure to follow the instructions below! Cut two jar like shapes from burlap. Lay on a surface that is protected. Paint both pieces with patio paint. The bottom of your jar should be blue while the top should be gray. Paint on white lines for the lid and all the way around the outer edge. Use black paint to personalize your flag with a saying. Use your sewing machine to sew around the outer edges. Leave about a 2 inch place on both sides that is not sewed together. 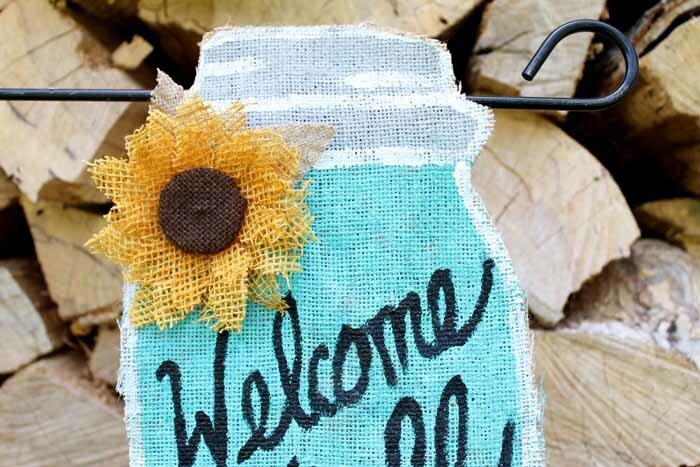 Use a glue rated for outdoor use to attach a sunflower and a few burlap leaves. These personalized garden flags are sure to put a smile on your face. They also make great gift ideas! So make a few while you have out your supplies. 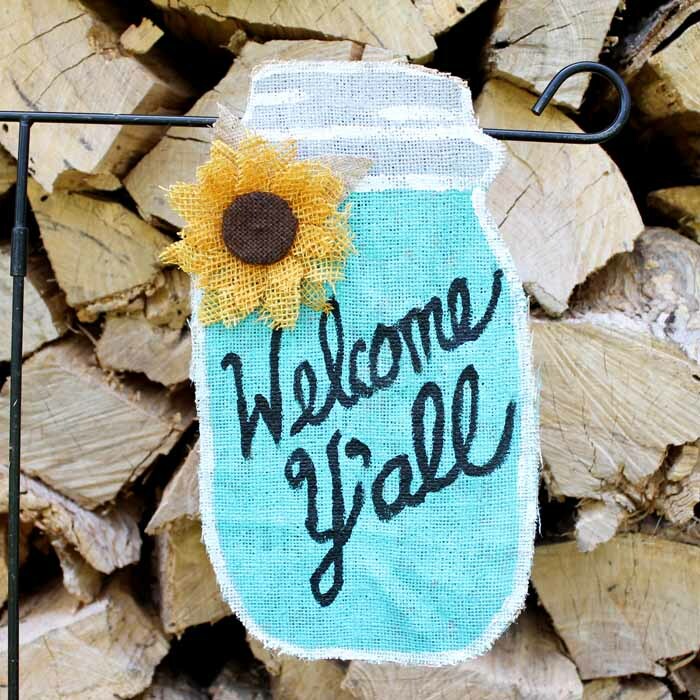 Add a summer mason jar to your garden. You will love how great it looks and the fact that you made it yourself. Personalized garden flags have never been so inexpensive! Love this and looking for more? Check out these other DIY flag ideas! Plus 18 more DIY garden flags! previous post: Recipe Organizer: Ways to Organize Recipes! 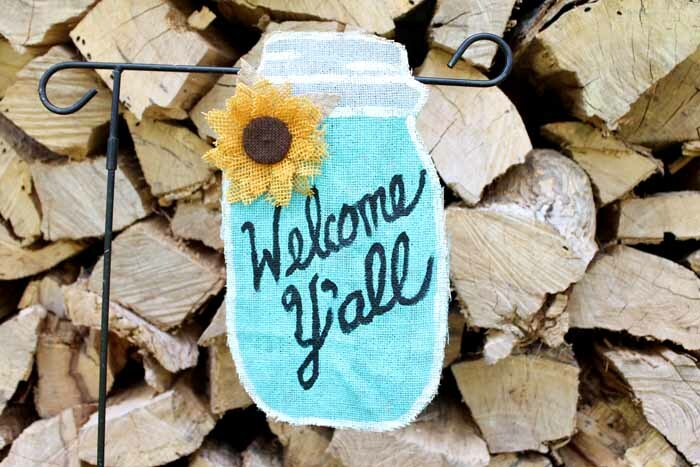 Love your jar flag, would love to make this. Might be getting a small portable pergola for our back deck so would hang it on the pergola. Neither hubs nor I able to build attached pergola so have to resort to other plans. Deck not big enuf for big 10x10ft.pergola so hopefully going to get 5x8ft. and use shade cloth to extend it. Make it so we can roll up shade cloth when not using as wind here is very strong. Gets so hot on deck in Summer with back of house facing due West, back door knob is super hot. Did you draw out the template for jar yourself? How big is the flag – height and width? Mine is mini sized as I have a mini garden flag holder. I roughly went by the size of the flag that came with it. I found a jar shaped chalkboard laying around here that worked fairly well and I went by it but made it a few inches larger on all sides! Hope that helps! It’s very cute – would love to have it in my yard. Hi! I’m one of the co-hosts from the Welcome Home Wednesday Link Up. I am in love with this adorable garden flag. You are speaking my language with the burlap and that color blue! 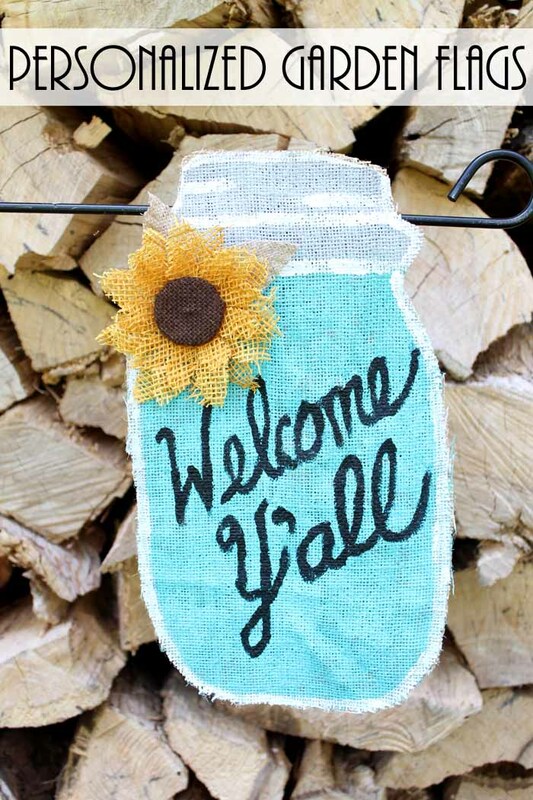 And of course Mason Jars and Sunflowers! I really want to make this adorable flag now. Thank you for sharing! Love this! Thanks for sharing the instructions! This is so cute! I’d love to make one of these. Thanks for sharing your tutorial at Creative Corner at Mom Home Guide. This is an adorable garden flag idea! Thank you for sharing at Merry Monday! So cute! Great tutorial! Thank you for sharing at the Snickerdoodle Create~Bake~Make link party!